Welcome to The Desmond Hotel Albany, voted the best in Albany hotels. We are an IHG (InterContinental Hotels Group) affiliate hotel conveniently located right off the Northway I-87 Exit 4, a 1/4 mile from the Albany International Airport, and adjacent to premier shopping and business locations on Wolf Road. We are in close proximity to major business parks in Corporate Woods and British American, Albany Medical Center, all major universities, and various government offices in downtown Albany. The Desmond is a family owned and operated property that has been providing superb accommodations, outstanding service and a unique guest experience since 1974. We are proud to be celebrating our 45th Anniversary in 2019. As an IHG affiliate hotel, our guests are eligible to earn and redeem points in the world’s largest hotel loyalty program – IHG Rewards Club. 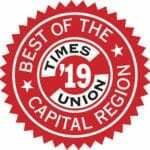 We are proud to have been voted “Best Local Hotel” 2019 among all Albany hotels – for the 12th consecutive year in the Times Union Best of the Capital Region awards. In addition to this local honor, we have also received the Certificate of Excellence Award from TripAdvisor every year since 2011. Our unique Albany hotel features 322 non-smoking guest room and suite options, including king size four-poster beds, spiral staircase duplexes, suites with private entrances and patios, and ADA accessible rooms. We combine rich Americana design and charm with modern amenities for the seasoned business traveler. Modeled after a colonial village square, our two indoor courtyards feature 30′ and 36′ high ceilings with large atrium skylights, mock storefronts, a koi pond, beautiful fountains, and guest room balconies that overlook year-round landscaping. Exceptional dining is available in Simpson’s restaurant and in our English pub The Tavern. Unique, versatile facilities plus our award-winning food and personal service, make us the perfect venue to choose among Albany hotels for an overnight stay or for your next event. Discover old world charm combined with modern amenities. We invite you to experience The Desmond. Copyright 2008 - 2019 The Desmond Hotel, Albany, NY. All Rights Reserved.